Finished Corner Handmade Frames at The Framer's Workshop, Berkeley, CA, Serving the San Francisco Bay ara including Marin, Oakland, and the East Bay. 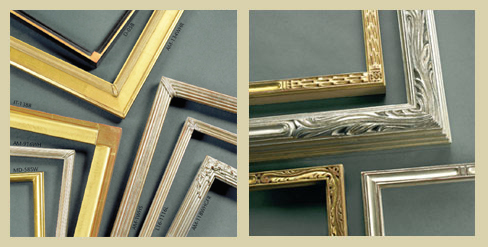 Finished Corner Frames, also known as Closed Corner Frames, are the ultimate in framing quality and craftmanship. Whether you're looking for craftsman style frames, fine watergilded gold frames, modern finished corner wood or steel frames, or frames from various historical periods, The Framer's Workshop can help design your order. We feature Rhonda Feinman Custom Frames, New Look Frames, Concerto Finished Corner Frames, A Street Frames Craftsman and Welded Steel style frames (far right), Dard Hunter mortise and tenon and other American hardwood arts and craftsman style frames. Whether you live in a craftsman bungalow or a modern masterpiece our designers will help you pick the perfect closed corner frame to compliment your art and your home. 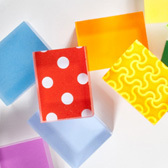 Come in to see samples or contact us for guidance. Read more about Finished Corner frames below. All Rhonda Feinman frames are custom made in their New York facility with utmost respect for the legacy of centuries of craftsmanship in frame making. The artisans of Rhonda Feinman Custom Frames hand carve wood, cast and apply decorative composition ornament, then gild only with genuine gold leaf to produce sensitive and faithful reproductions of fine antique frames. Time tested traditional techniques and materials are used to assure lasting quality. Amost all Rhonda Feinman frames can be ordered in your choice of size and finish. Gilded finished corner frames have a layer of gesso over the mitre joint. They are then surfaced with gold leafing or paint, for a seamless continuing design. Hard wood frames are either made with mortise and tenon joints or are finely sanded on the corners to create an invisible seam. Since these products are custom made to your exact specifications, delivery time is usually 4-6 weeks, so we ask you to plan ahead. Come in to see our samples and view our catalogues for even more choice. Feel free to contact us for guidance.